Kukan is a 1941 documentary made by Rey Scott that highlights China’s resistance to Japan during the early years of World War II. 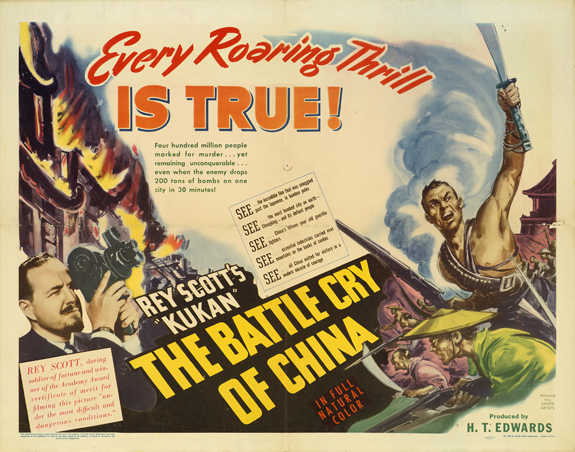 It received an honorary Academy Award that cited Rey Scott “for his extraordinary achievement in producing Kukan…under the most difficult and dangerous conditions.” It was then lost for fifty years. 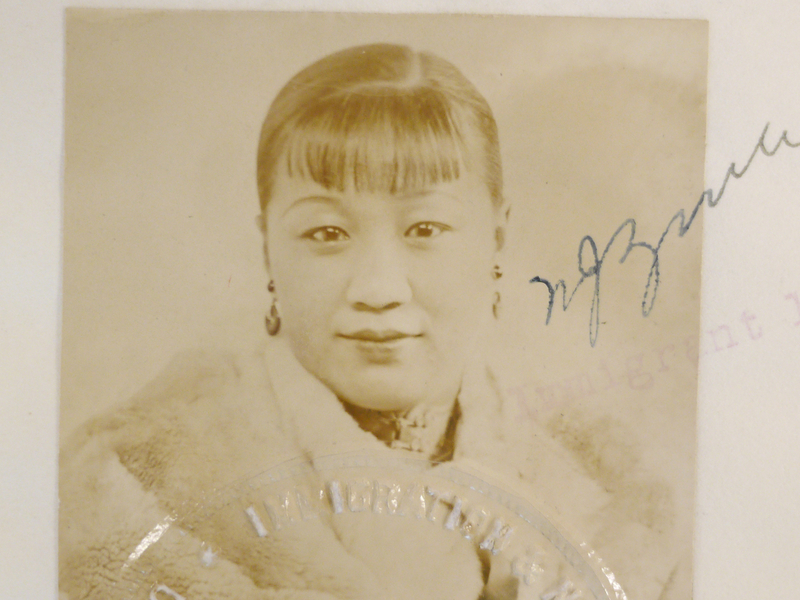 Ling-Ai Li, a Hawai'i-born Chinese woman, worked with Rey Scott. Robin Lung discovered Ling-Ai Li, found Kukan, now being restored, and is in post-production on Finding Kukan, her feature length doco about Ling-Ai Li and the film. Robin is a 4th generation Chinese American raised in Hawai'i, a graduate of Stanford University and Hunter College in NYC, and has been producing short films and documentaries for the past ten years. In the present, Finding Kukan is the story of Robin’s travels and search for evidence about Ling-Ai Li and the film. 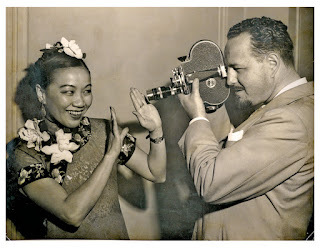 To flesh out the historical story, it uses interviews with historians, family members and friends, a 1993 interview with Li Ling-Ai herself, archival newsreel, sound recordings and home movie footage of Li Ling-Ai and Rey Scott and actual color footage from Kukan. 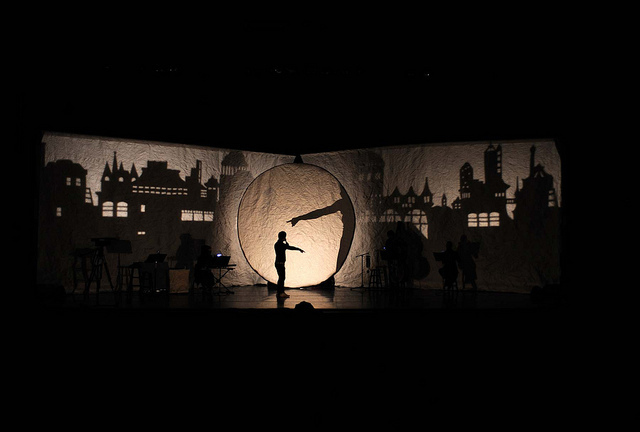 In addition, an innovative technique combines theatrical readings by actors filmed in high contrast black and white with abstracted shadow plays enhanced by animated special effects, to offer direct 'emotional entry' into the past. It brings to life intimate or especially harrowing historical scenes from the point of view of the protagonists, to encourage audiences to activate their imaginations and bring their personal frames of reference to the historical story. These staged readings are drawn from Li Ling-Ai and Rey Scott’s letters and interviews, multitudes of newspaper and magazine articles, David Selznick’s papers and John Huston’s letters and autobiography. Extreme close up shots of the physical copy of Kukan being assessed and restored will act as a visual time machine or bridge that transports us from one thread of the story to the next. And lushly colored HD footage of Rey Scott’s grand-daughter, Michelle Scott, creating her mixed media 'Kukan' pieces will act as interstitials and a visual metaphor for the resurrection and re-telling of the story. I fell over the Finding Kukan Kickstarter campaign (now over, having reached its goal) and loved it, including Michelle Scott's art work. I'm enchanted by the extended teaser (below). This interview is to learn more about the story to date. Q: You found Ling-Ai Li because you were looking for a heroine to emulate. What exactly were looking for, and why? How did you find her? And what was it about Ling-Ai Li that made her just right for you? As you learned more about her, what’s most exciting about her, for you? I was looking for the real life inspiration for a wonderful fictional character that I found in a series of vintage mystery novels written by Juanita Sheridan. The fictional character Lily Wu was notable because she is portrayed as superior to most of the Caucasian characters she encounters. She’s smarter, sexier, more worldly and more daring than many of them yet she never denies her Chinese heritage, and draws on her Chinese connections to give her strength. She is not above lying to the police or using men to solve the crime which usually involves correcting some kind of injustice. When I read that Juanita Sheridan based her fictional character on some real life friends, I thought that if I could identify who one of them was, I might find a story that could be turned into a film. By following clues in the detective novels I ran across the author Li Ling-Ai and learned that she had worked on a film called Kukan. 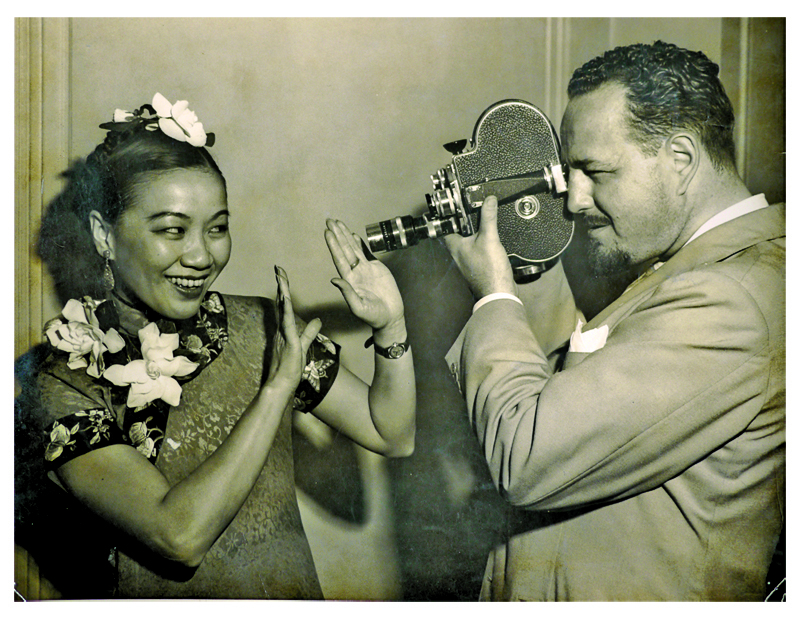 Li Ling-Ai turns out to be a pioneering media maker on many fronts – besides producing an Oscar-winning documentary about war-torn China, she was an early radio and television personality and wrote a seminal memoir about her physician parents in turn of the century Hawai'i. What really captured my imagination, however, was Li Ling-Ai’s audacious personality. Her friends and relatives refer to her as a 'Chinese Aunty Mame'. She was bold and brash, glamorous and egotistical, but she also had a generous heart and used her charm to break down negative stereotypes associated with China and Chinese people. 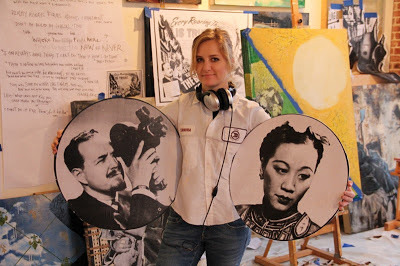 Q: I have a little obsession with ‘lost’ women artists. I understand that Ling-Ai Li isn’t credited in Kukan. Do you know why? How do you know she worked on it? What exactly was her role? Li Ling-Ai is credited as the Technical Advisor in Kukan’s film credits, but she always referred to herself as the co-producer of the movie whenever she was interviewed about it. I’ve discovered that she instigated the film, helped finance it, made it possible for Rey Scott to film it in China by providing him with introductions to her friends and relatives, worked with the distributors to package it for theatrical release, and traveled the country promoting it in both its rough cut form and its final theatrical format. She really did fulfill all of the functions of a producer. The distributors of the film end up claiming producer credit for it. Li Ling-Ai says later in life that it meant more to her to get the word out about China’s plight than it did to get the credit for the movie. And, as a young, naïve filmmaker, she didn’t know better. I believe, however, that she always regretted not being properly acknowledged for her role in Kukan. Q: You’ve written “It's not just about saving a film. It's about expanding our history and our horizons.” What does this mean to you? And who are the ‘our’ for you? Why? Discovering the film Kukan opened up a whole new world for me. Uncovering the many layers of buried history surrounding the film has empowered me as a woman, as a filmmaker and as a Chinese American. Connecting personally to history can be a life-changing experience but many times the stories that allow us to do that are lost or forgotten because they exist on the margins of history and are easily disregarded as insignificant, or they are not politically expedient to tell from one generation to the next. 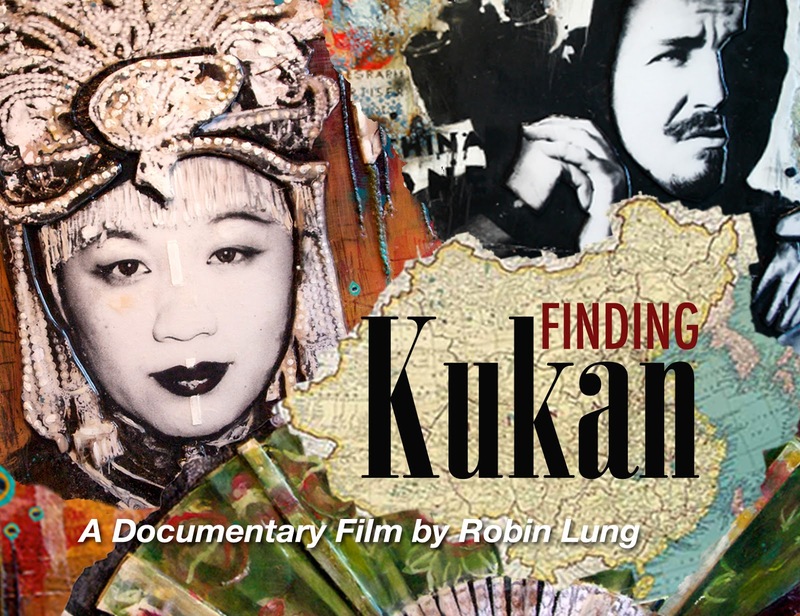 With Finding Kukan I hope to inspire people from all walks of life to preserve their own personal stories and the relics that aid in their telling, no matter how arduous or painful that effort may be. Q: Is this the first time you’ve produced and directed a feature? Do you identify more as a producer or as a director? In 2008 I produced and directed a short documentary on Hawai'i’s last Queen for my local public television station, but this is my first feature documentary. I often feel schizophrenic by taking on the role of both director and producer. I would love to have the luxury of solely directing, but I have not yet found a producer who is as obsessed about the story as I am and willing to work for no pay or deferred pay. I’m hoping that will change and would dearly love a co-producer with the passion and commitment of Li Ling-Ai. Q: You’re driven to preserve the stories of extraordinary people from minority backgrounds who are often overlooked by mainstream media. Women are not in the minority, but I sense you’re also very interested in women’s stories. Are they important to you? Why? Women are in the minority when it comes to history since their stories are not nearly as well-preserved as men’s stories. I feel an obligation to document women’s stories because of this. Q: I’d love to know about how you found Kukan. 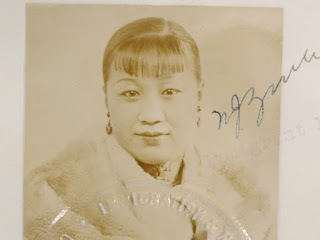 Li Ling-Ai was largely responsible for me finding Kukan even though she died several years before I started researching the project. She included a passage about Kukan in her memoir about her parents, and that’s how I first found out about it. She also continued to tell her friends about the film even though she didn’t have a copy of it to show them. Something one of her friends told me prompted me to search for the film in the National Archives, and I found a partial copy of it there. Once I had that, I made a big effort to find Rey Scott’s heirs since Rey Scott held the copyright to the film. I spent weeks trying to locate Rey Scott’s obituary and finally discovered it through a database called Find A Grave.com. Fortunately Rey Scott had four sons and two of them were on Facebook. The sons ended up having a badly damaged full copy of the film and a scrapbook of articles about it that detailed this incredible story. It’s really Li Ling-Ai’s persistence in telling and documenting her own story that allowed me to find and then save this important part of film history. Q: Where has your support come from? I love the Hawai’i Women in Filmmaking group on Facebook, Twitter and Pinterest. Are you a part of the group and is that helpful? Is there a strong community of women filmmakers in Hawai’i? My financial support has come from a few small grants and many donations from private individuals. I’ve also had an amazing amount of in-kind support. People have donated time, taken me into their houses, fed me, driven me around, done research for me, etc. Funding continues to be a challenge, however. The Hawai'i Women in Filmmaking group is a great resource here. It’s really helped me network with other filmmakers (women as well as men), and provided me a venue to get feedback on work-in-progress. The group also hosts filmmakers from other parts of the world and I’ve gained valuable insights from hearing those women speak. Q: How did you link up with Michelle? Do you both live in Hawai’i? Has she got a moment to write about how it’s been for her to be involved in the project? Michelle now lives in Atlanta and we met over the internet after I discovered her website for her paintings. 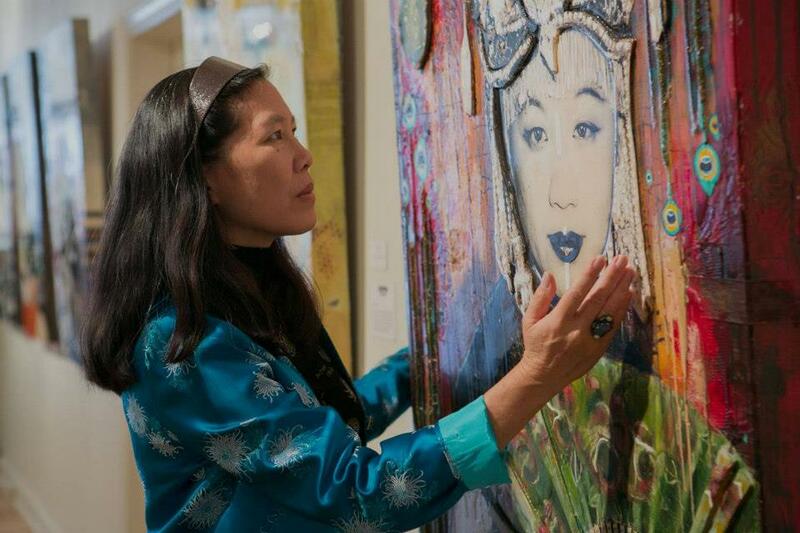 She had already created a gorgeous portrait of Li Ling-Ai but didn’t know who the woman behind the face was. Since that time, we’ve become very close and I’ve gone to Atlanta to meet her a few times, even attending her wedding this past January (from Hawai'i). The story has inspired her immensely. I’m not sure how much time she has to write about it though since she is due to give birth to her first child in a month or two! Q: You have a very impressive team. How did you bring everyone together? Were they people you’d worked with before? I worked with my executive producer Kimberlee Bassford for 2 years as the associate producer on her nationally televised documentary about Patsy Mink. A couple team members came to the project through Kimberlee. I met my editor Shirley Thompson at a HWIF event. Larry Reed and Chris Do, the shadow master and animator I’m working with, were online connections I made after scouring Youtube videos for a visual treatment that I felt would fit the story. And recently the composer Alex Wurman came on board through a connection with a family friend in Los Angeles. All of my team members have come on board because they really responded to the story, and I’m grateful to be able to draw on their experience and creativity. Q: What have been the highs and lows of the project so far? Highs continue to be discovering new things about the story. I’ve hit a lot of research dead ends but also have found lots of archival gold that supplements finding the actual film. Making our Kickstarter goal made me ecstatic too! Knowing that many people are behind me has helped a lot when grant applications that I spent weeks preparing come back with rejection letters – that always sends me spinning into canyons of self-doubt. Q: Where exactly are you in the process? I understand you’re planning to show Finding Kukan on television, but I wonder whether you’re also considering film festivals. We just wrapped up principal photography, and we are heading into post-production at the beginning of June. Besides editing, we face the tricky task of bringing the historical story to life. We also have a lot of money to raise to finish the film, but I’m trying to tackle it in stages. We’ve set up a Gift Registry people can go to help us fund a strong work-in-progress cut that can be used to apply for finishing grants with. By visiting the Registry, people can gift us anything from an hour of editing to a scan of a historic lantern slide of 1937 Nanking. If all goes well, I hope to finish the film at the end of 2014. I would love to screen it at film festivals and for community groups as well as on TV. The prospect of being able to share the story with others is what keeps me going forward one little step at a time. Robin is now raising post-production funds through Simple Registry.